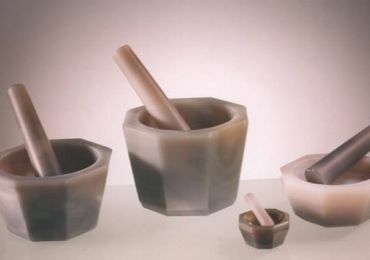 Custom-made grinding mills and agate mortars.. Right in the picture are our mortars AG, i. deep model shown. The mortars in the deep version are available in outside diameters from 60 to 150 mm with pestle. Of course, individual pills can also be delivered. The mortars on the right show the normal high execution in the quality "Extra", i. with double bevelled edge. The sizes of the quality "Extra" correspond from the outside diameter of 40 mm to the sizes of the quality "Standard". 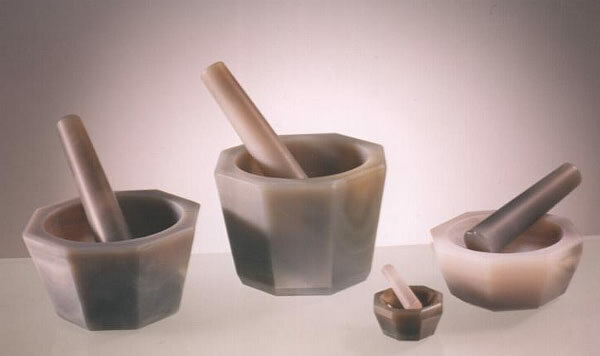 We are also able to produce according to drawings, so that we can meet your individual needs and wishes, such as accurate inside dimensions, and depths can also be considered in the field of hand mortars, as long as the natural material allows agate.